Seeing a bunch of real fire airplanes up close. At bedtime later we made up stories about them (inventing a trio called Hoser, Big Belly, and Tank, who save Hoot, Milos, & co. from immolation). Walking up the tail ramp & then around inside an enormous C-17 Globemaster III. 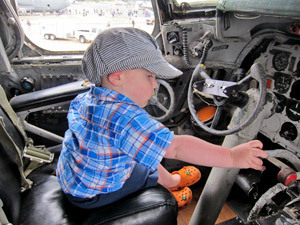 Now Henry announces, "I'm a C-17! I'm putting trucks in my big boca!" --after which he tries to ingest my fingers (the "trucks"). Enjoying the bunk beds on an old DC-6 Liftmaster. Finn especially liked picking at the ancient seats ("Look, Dad-O, I'm making the foam disintegrate!") until I put a kibosh on that fun. Watching the Sonoma County Sheriff's Office demonstrate the Henry 1 chopper! The machine is used for retrieving lost hikers (just like Harold in Thomas's Misty Island Rescue). I didn't record the video below, but we watched a very similar demonstration, complete with booming explosions, "bad dudes," & smoke. Too bad we never did find their booth & get Henry 1 T-shirts. Thanks to Noel & Bruce for being excellent wingmen*! Our guys were troopers with the sun & noise ("The [F-15] Eagles were too loud," Henry keeps noting), and I foresee many happy returns. * See what I did there? Bah-dum, tssch!